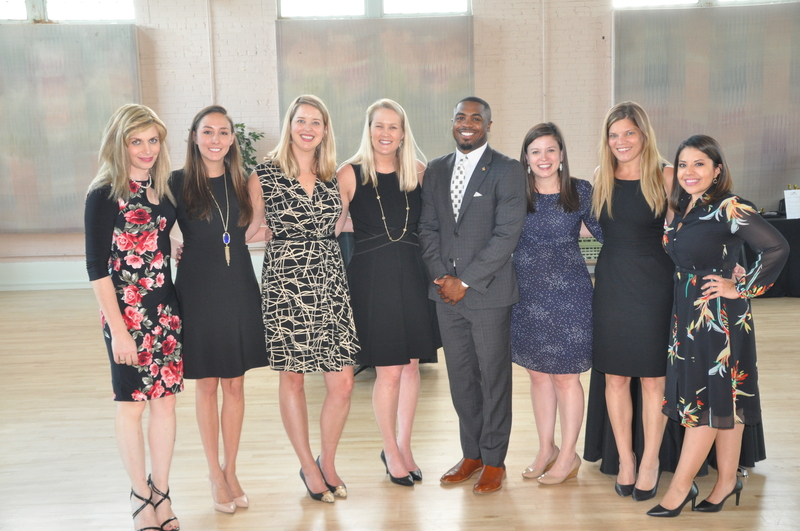 DAYL’s Equal Access to Justice Committee hosted its annual Wine Tasting on June 21, 2018 and benefitted the Dallas Volunteer Attorney Program, which provides free legal services to indigent citizens in Dallas. This year the event was held at the Sammons Center for the Arts and featured wines from Texas with country music. For the first year, attendees also received a commemorative wine glass to take home. The EAJ Committee was honored to present Allie Smith of Baker Botts L.L.P. with this year’s DAYL Pro Bono Service Award. Allie completed over 300 hours of service in 2017, including impressive work with Genesis Women’s Shelter. Allie also shines as a champion of pro bono work, taking time to improve the pro bono process for other lawyers and consulting with others on their pro bono cases. DAYL and the EAJ Committee applaud Allie’s commitment to giving back to our community. At the wine tasting, DVAP representatives were on hand to provide more information to attendees and brought a sign-up sheet for lawyers in attendance who wanted to take a pro bono case. Also, representatives from the DAYL Pro Bono Partners Committee spoke about its efforts to make it easier for legal professions to engage in pro bono work, encouraged attendees to commit to the Pro Bono Project of at least 12 hours of pro bono work this year, and recognized those who completed their pledges from last year. The event was a huge success and the committee is thrilled to have raised over $15,000 this year to benefit DVAP and the great services they provide. This donation to DVAP and the entire event would not have been possible without the support of all of the generous sponsors, particularly Baker Botts L.L.P., Robert Half Legal, Jackson Walker L.L.P., Winston & Strawn LLP, and Akerman LLP.